Waking up to a clear, sunny day provides the perfect opportunity for a few rounds of golf. However, it can get warm out there on the green. Ordinary hats provide shade, but most won’t help you beat the heat. Take a closer look at some of the clever hats which will actually keep you cool on the golf course. Greg Norman wore toyo straw hats when winning masters events all around the world — not because they were stylish, but because they kept his head cool. And if it’s good enough for the Shark, it’s probably good enough for you. Toyo straw hats have ventilated tops, which allow heat to leave your head so you stay cooler on the green. They also have wide 360-degree brims to keep the sun off your ears and the back of your neck. That extra shade helps lower your body temperature. Greg Norman signature toyo straw hats are available from a range of retailers, including Amazon.com and the Greg Norman online store. They have a recommended retail price of $38. Mesh hats take the ventilation of toyo straw hats and turn them up a notch. 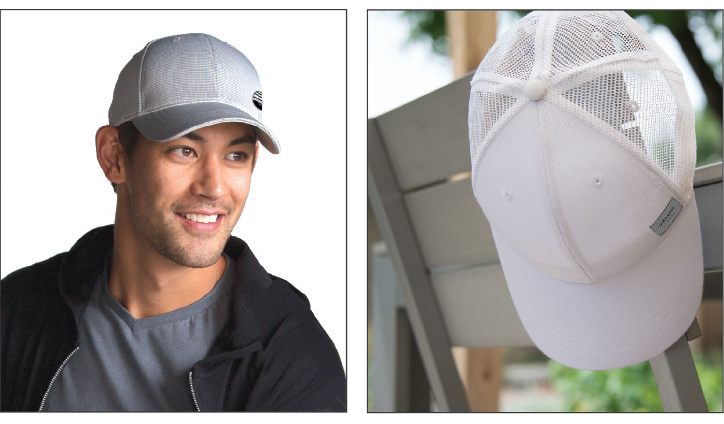 Rather than keeping the open weave to the top, mesh hats have ventilated side panels as well. These hats allow warmth to escape from your head so you don’t overheat. Some people worry about that mesh hats won’t protect them, but as the holes are quite small, their UPF ratings aren’t severely impacted. Mesh hats are very affordable, costing between $10 and $20 on average. They’re available from fashion outlets, department stores, and sports stores. Many people know that fabrics made from bamboo are sustainable, but you might not realize that bamboo has a range of cooling qualities. Bamboo is breathable, so these hats won’t hold heat close to your head. Bamboo also wicks away moisture like the sweat on your brow, so you’ll feel much more comfortable on the golf course. Studies show that bamboo is actually 3 degrees Fahrenheit cooler than cotton, so perhaps it’s time to ditch your usual baseball cap and choose this eco-friendly material instead. Bamboo hats in a range of colors are available from Cariloha Bamboo for $32. Evaporative cooling hats use the process of evaporation to help you beat the heat. Simply submerge your hat in cold water for at least two minutes before your game, wring the excess moisture out, and you’re good to go. The hat’s fabric inner lining retains the cool water and draws heat away from your head, helping you feel up to 20 degrees Fahrenheit cooler. It works for around five hours, which should give you enough time to play 18 holes. This technology is used by Olympic athletes, so just imagine what it could do for your game! Evaporative cooling hats are available in a variety of styles for around $20 from online retailers including SkyMall and Real X Gear. Cooling crystal hats also use the evaporation process to help you beat the heat. These hats feature crystals embedded in the fabric or removable inserts. Soaking the hat or crystal insert for five minutes before your game activates the crystals, turning them into a cooling gel. Your hat will feel dry to the touch as the gel retains the moisture. Depending on the hat, the gel will sit against the top of your head or around the sweatband, keeping you cool for hours while you play. Cooling crystal hats are available from a range of specialty retailers including Personal Cooling Products and Bluebandoo. Prices vary from $23.95 to $40, depending on the type you choose. Don’t forget one of these clever cooling hats next time you step out on the green.